Were Lombardi's, John's, and Pop's all founded by the same person? It’s not every day that a major bombshell drops in the pizza world. So though despite not yet even having a title, a forthcoming book from author Peter Regas is already purporting to rock the world of marinara and mozzarella to its core by lending some intense historical fact checking to New York City’s iconic pizza scene. Regas is set to present his findings during a free lecture at the U.S. Pizza Museum in Chicago on Saturday, February 23 entitled “Filippo Milone and the Forgotten Pizza Makers of New York City.” At the event, the author promises to present his findings that both Lombardi’s on Spring Street and John’s on Bleecker Street — two of the best know pizzerias in a city known for pizzerias — were not founded by their namesakes, but instead were originally opened by an Italian immigrant and baker named Filippo Milone — a bit of a “Johnny Pizzaseed” if you will. 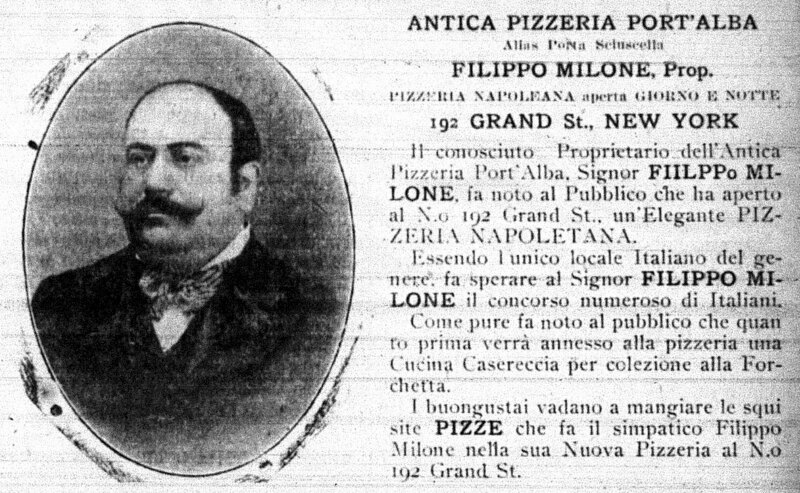 Regas discovered this Filippo Milone pizzeria advertisement in the May 9, 1903 issue of Il Telegrafo, an Italian language newspaper published in New York City. More specifically, Regas’s alleges that documents he has uncovered while doing research for his pizza book show that the origin story of Lombardi’s — that Gennaro Lombardi founded America’s first licensed pizza parlor in 1905 — doesn’t quite hold water. Instead, Milone likely (at least helped) open the joint in 1898 before it eventually came into the hands of a man by the name of Giovanni Santillo in 1901. 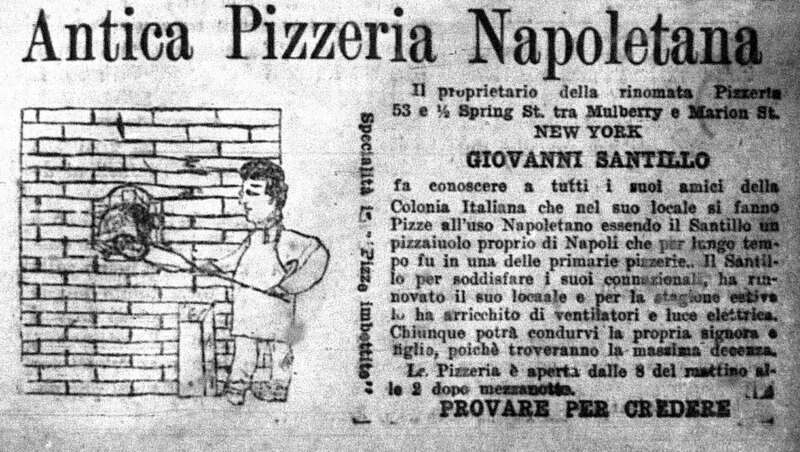 Regas discovered this newspaper advertisement for Antica Pizzeria Napoletana at 53 ½ Spring Street, featuring proprietor Giovanni Santillo, in the March 25, 1905 issue of "Il Telegrafo." Regardless of the doubt Regas is casting on the founding of America's oldest (and still operating) pizzeria, the author doesn't think his findings diminish Lombardi's legacy. "I've reached out to Lombardi's and have yet to hear a response," he told me via email. "Gennaro Lombardi was and remains a key early figure in the history of pizza in the U.S.A. Understandably my research is a dramatic change in their origin story. But if anything it makes Lombardi's a more historic pizzeria." Meanwhile, John’s says it dates back to 1929, but Regas suggests that Milone got it up and running in 1915. John Sasso — of “John’s fame” — was apparently a relative of Milone’s by marriage, adding to the intrigue. Though Regas’s book isn’t set to be released until later this year, he has launched pizzahistorybook.com to start spreading his findings — as well as to receive feedback if you have information to the contrary. “I’m posting my research notes online to find errors of fact, omission, or interpretation and correct them before my book is published,” he writes. “For the record, I’m not: a professional genealogist, fluent in Italian, an expert in Italian history, related in anyway to these pizzeria families, or in anyway associated with the pizzeria industry. I’m just a guy who’s interested in how things begin and how they end.” He’s also giving his lecture in Chicago which — to NYC pizza lovers — may be the biggest red flag of all!